Roaming Stamper: I'm so embarrassed! I couldn't believe it when I signed on today and realized I haven't blogged since Thanksgiving! Where in the heck have the past 2 weeks gone? I'm sure everyone is busy, I know I've been. Between decorating, shopping, wrapping, and preparing for a trip; my life has been nuts! I do have something to show you one of the projects my stamp clubs made this month. I also have some other cool cards to show you this week from a couple of swaps I participated in. Soon, I'll show some cool gifts that I made but that's later on in the month. 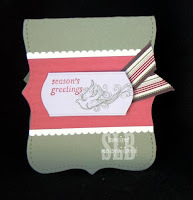 I made this gift card holder using the Top Note Die for the Big Shot and the Handmade Holidays Card elements kit. I really loved the ease of this holder. The inside features a pocket made from the Top Note that was cut about 1/3 of the way down. All supplies from Stampin' Up! I've made so many gift card holders over the last few weeks but this one has got to be the easiest. I love being able to just pick something out and put it on a page and it looks great because it's all coordinated! Hi Sharon, good to see you blogging again! Cute project - and so easy!